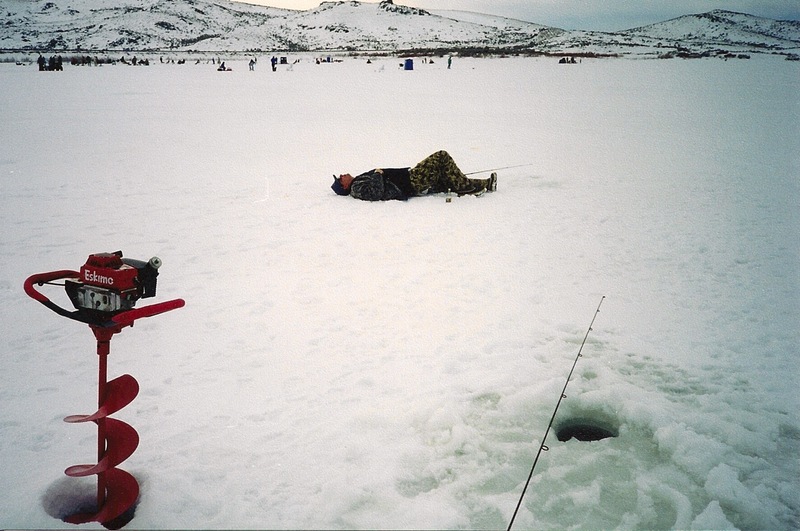 An ice fisherman taking a rest after an exhausting day on the ice. It has been a Cassinelli family tradition for several years to go ice fishing when the lakes and reservoirs are safe for ice fishing. Ice must be a minimum of six inches thick to be safe. If there’s corn snow above the solid ice, it may need to be even thicker. With the use of either a power auger or a hand auger, a 6-to-8-inch hole is drilled into the ice for each fisherman in the group. Those with a second rod stamp can use two holes. Usually 4-6 or more of us pick a date in January or February and decide which lake or reservoir to try. Some of our favorites are Wild Horse Reservoir north of Elko, South Fork Reservoir south of Elko or Cave Lake southeast of Ely. We have also been known to go to Red Lake or Caples Lake along Highway 88 in California for day-trip fishing.